Elante of Alinor is an Altmer sorceress and scholar of Daedric shrines, who needs your assistance navigating Brittlerock Cave. She wears a green silk garment, a green brocade doublet and a pair of green velvet shoes. Besides her spells she uses a silver dagger in combat. She also carries a leveled amount of gold. After you have received the contract from Azzan, he will provide you with some information on Elante should you ask about her: "Elante is a scholar, interested in researching Daedra worship. Meet her in Brittlerock Cave, help her find the shrine, and keep her safe." If you ask him about the Daedric shrine, he will simply provide you with a reminder: "That's what Elante is studying. Make sure she's safe while she does it." He will then send you off with: "Go protect Elante. She's doing important research." Members of the Fighters Guild can also be heard talking to each other about the contract, expressing confusion in Elante's request: "This lady wants to study Daedra, so she buys a guild contract. You ever heard of anything so goofy?" and "She's got no business poking around in Brittlerock Cave, but the customer is always right, eh?" Once you first speak to her in her related quest, she will warmly greet you with: "Ah, you must be from the Fighters Guild. Excellent! I'm looking forward to our investigation. Fascinating subject, these Daedra." Asking her about Elante of Alinor will have her confirm her identity: "I am Elante of Alinor." Asking about the Daedric Shrine before descending into the cave will earn you the words: "My research shows there is likely a shrine in these caves. I'll need you to accompany me to the shrine, handle any... difficulties." After entering the cave her greeting will become: "What can I do for you? We need to head to that shrine." Asking her about Daedric Shrines again will have her respond eagerly: "Yes, let's investigate! And keep on your toes!" Speaking to her once you reach the first Daedric Shrine will have her greet you with: "Excellent. A fine example of a Daedric shrine. Sorry for the trouble getting here. Let's keep moving." Once you reach the second shrine, Elante of Alinor will inform you that your services are no longer required: "I think I'll study this shrine a bit longer. You can make your way out here. I thank you again for your help. Please, take this token of my thanks." She will then give you a copy of the Blade skill book 2920, Morning Star (v1). Asking her about Daedric Shrines at this point will have her say: "A fine study to add to my research. I thank you for your help." any consecutive questions on the subject of Daedric Shrines will earn you the response: "I appreciate all of your help. Thank you." After completing the quest, citizens of various towns may mention her based on your completion of the quest. For example if you save her, they will say: "Elante of Alinor? She's the Daedric scholar, right? She'll live to write again, thanks to the Fighters Guild." Members of the Fighters Guild can also be heard talking about your success in fulfilling the contract: "Azzan says the scholar lady was lucky to get back alive. But Oreyn's new 'hard hand' did just fine in a tough situation." The Wandering Scholar: Elante of Alinor wishes to study a Daedric shrine and needs protection. 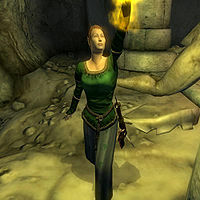 Elante makes an appearance in Morrowind, within the cave of Ibar-Dad - the tomb of Mordrin Hanin - wherein Elante is encountered as a hostile NPC; her notes indicate that she was engaged in researching the Daedra therein. This page was last modified on 25 March 2018, at 02:49.